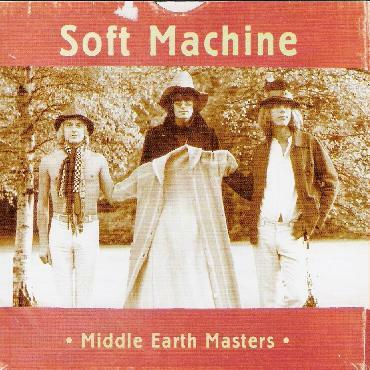 Soft Machine - "Middle Earth Masters"
Cuneiform's Middle Earth Masters presents the Soft Machine long before the release of the group's first album in 1969. And as such, this live recording from 1967 reveals the group as both a product of the times and as a potential revolutionary force in the then burgeoning Canterbury scene. Curiously, many of the songs on Middle Earth Masters present the early Softs as harbingers of the acid freak outs for which Pink Floyd were much more noted. The crazed trippiness of "Clarence in Wonderland" and "Bossa Nova Express" are signature testaments to the idiosyncratic pop genius of Kevin Ayers (at this point the Softs' primary guitarist), while Robert Wyatt's touching "That's How Much I Need You Now" is almost a germinal of his future development into one of rock's finest-though sadly underrecognised-songwriters. But the group really stretch out on such experimental improvisations as the lengthy "Hope for Happiness" and the atonal "Disorganisation." The former wails like an unbound monster from the id, with Ayers' massive fuzz guitar blazing a path through Wyatt's furious though controlled drumming and Mike Ratledge's deranged organ. If there's an analog here, it's the Floyd's first two masterworks of cosmic psychedelia, The Piper at the Gates of Dawn and A Saucerful of Secrets, with perhaps a touch of the kind of poetic zaniness Daevid Allen would go on later to create with the early Gong. Considering that much of the material on Middle Earth Masters was recorded during the heady months of the Summer of Love, the recording quality - while not exactly pristine - is surprisingly good and on a par with similar live recordings of the time. The real reason for owning Middle Earth Masters, though, is for the revelation it provides as to the early impetus of the Soft Machine itself: a concatenation of pop psychedelia, jazz-influenced improvisation and a willingness to experiment with the varied compositional forms of rock structure that, at the time, modern technology was just beginning to make possible. In this sense, Middle Earth Masters serves a vital purpose: a privileged glimpse into the evolution of one of rock's most important alchemists of sound.